Yesterday was Memorial Day in the US. 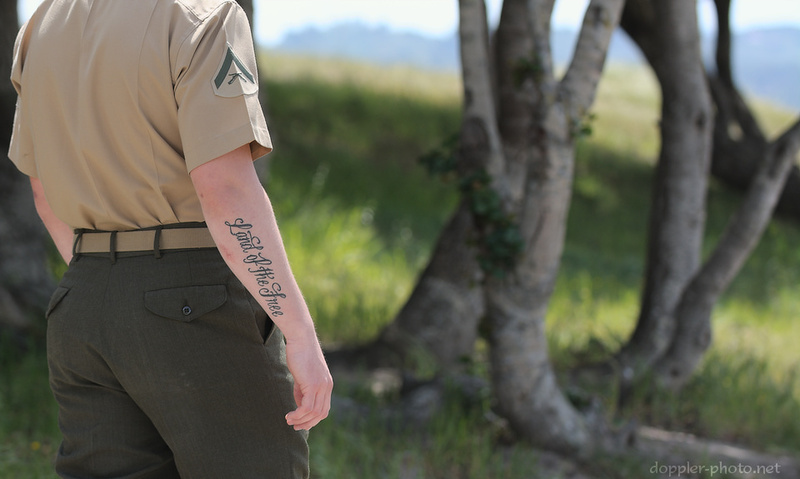 With the realization that I haven't paid it much attention in prior years, I decided to spend a couple hours meditating on what Memorial Day means to me, and why and how it should be meaningful for me. I concluded that I want to acknowledge and reflect on the contributions and the sacrifices, perhaps unknown or simply unacknowledged, that have helped shape my life and the world that I live in. First, in its purest form, Memorial Day reminds us to recognize the sacrifices of members of the armed forces who have died while serving our country. Beyond that, my mom has always held that funerals aren't for the dead so much as they are for the living. One interpretation might be that the reason we celebrate people who have passed is to help us realize things and the people we might have missed in the present, and to also recognize the promise that the future still holds. With that in mind, I decided to continue this post by simply acknowledging other groups of people whose contributions may have gone unacknowledged. 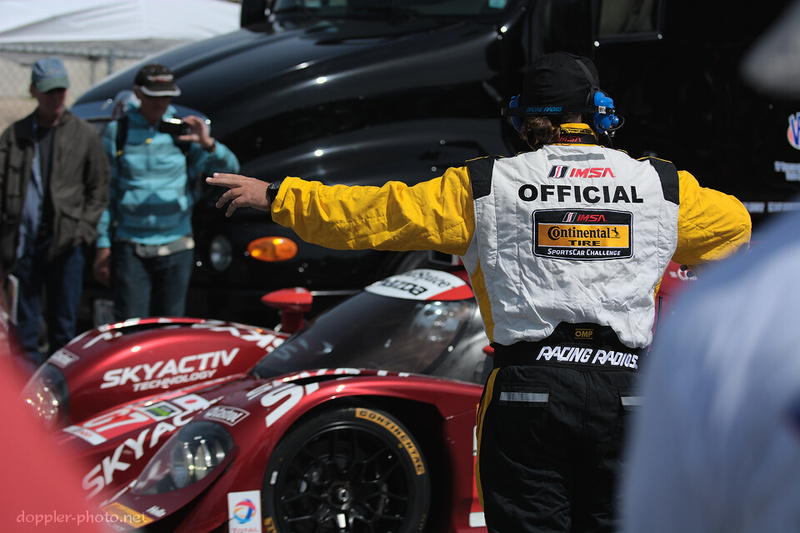 All of the photos are from the Continental Tire Monterey Grand Prix, held 3 weeks ago at Mazda Raceway Laguna Seca. The Saturday events that weekend also celebrated the United States men and women in uniform. Meet Rod (left) and Patrick. 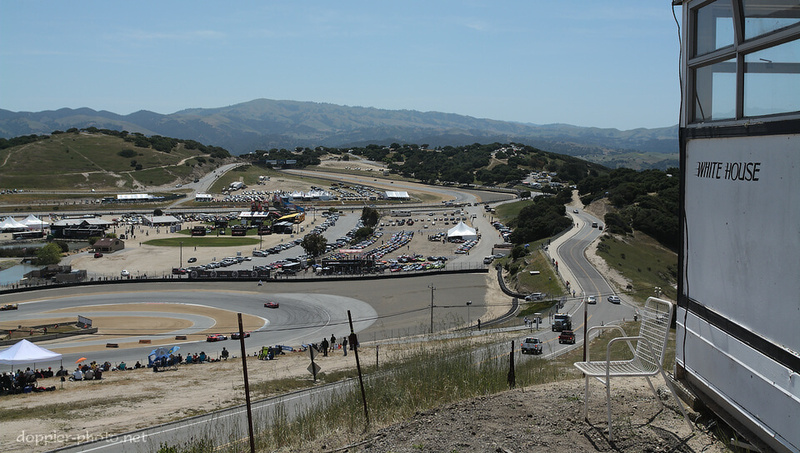 They're a big part of the races at Laguna Seca, and I didn't realize their role existed until I bumped into them while hiking uphill for a new vantage point. 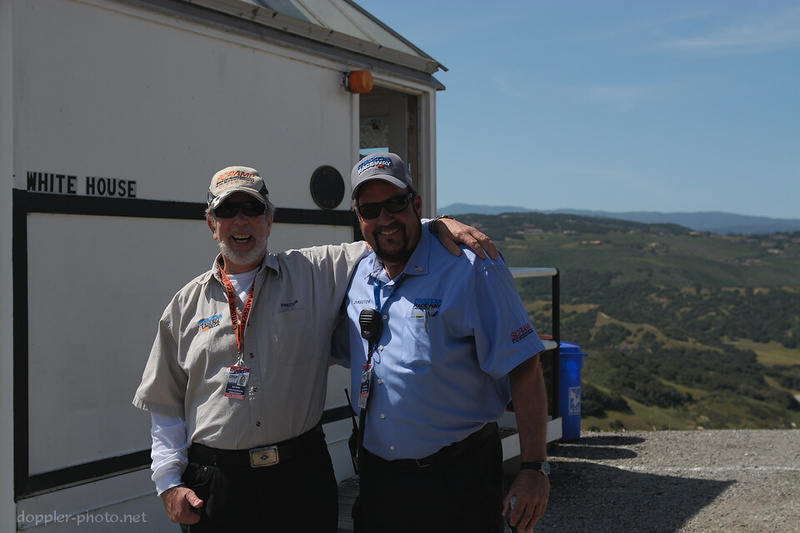 After this portrait, I had a chance to chat with Rod about his history with Laguna Seca. First and foremost, it's 42 years of history. Rod is 75 now, and when we talked, he brought me back to what this track was like, and what racing was like, before I was born. Initially, he got into motorsports by way of karting and autocross. He raced and he ran track days, and eventually he ended up with a job at Laguna Seca. Rod's official title is "Active Past Director." He spent years upon years as a race director, and now he continues to hang around and help out. Additionally, he serves as a prison minister when he's away from the track. Their subtitle is "Vehicle Control," and their post is the White House, which sits at one of the highest vantage points around the track. And near as I can figure out, their job is to watch the entire track and coordinate the movement of pace cars and safety vehicles, and to manage other situations that require immediate context about the state of various locations around the track. Rod also mentioned that the road to the right side of the picture is the course of the old track, which ran from what is now Turn 2 (Andretti Hairpin), to what is now Turn 5, visible in the distance. The track infield (Turns 2 through 5) was added in 1988 to extend the track for FIA homologation purposes — according to Rod, Formula 1 racing required a minimum track distance of 2.0 miles at the time. Of course, Vehicle Control is a team, not just a few individuals who sit on a hill. Once the team has a plan, it's up to the people on the ground to execute that plan and, in this case, to get the racecars gridded up for Saturday's Tudor Championship practice session. Members of the Vehicle Control team would line the cars up in order at the track entrance, and then the person in the picture would control entry into the pit lane itself. 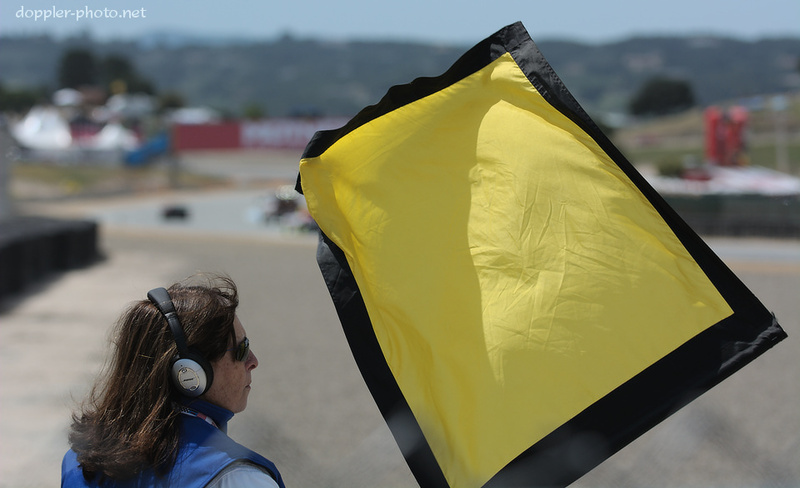 The team on the ground also includes the flaggers, who alert the drivers of impending track conditions around blind corners and the like. The waving flag always means "you are approaching an incident; be cautious." And when the incidents are serious, the pace car comes out to control the speed, and more importantly, the position of the field. 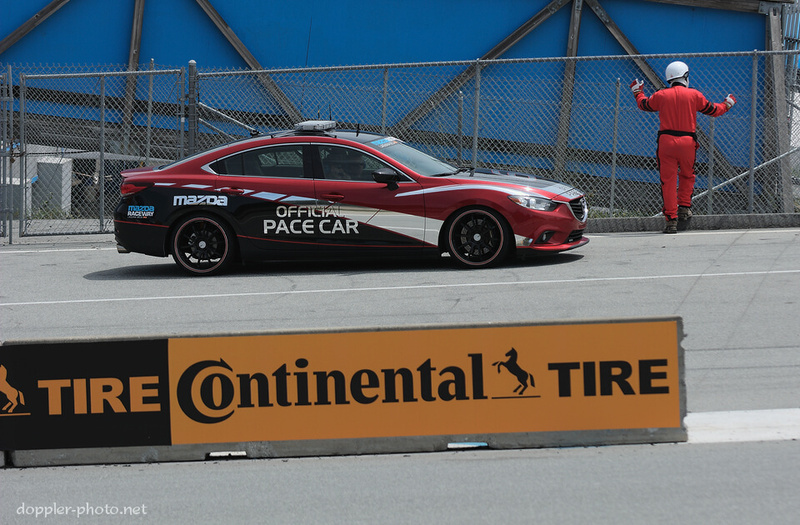 This allows the safety crews to safely cross the track if needed, because the pace car can slow the field down in a section of the track that's away from the incident. 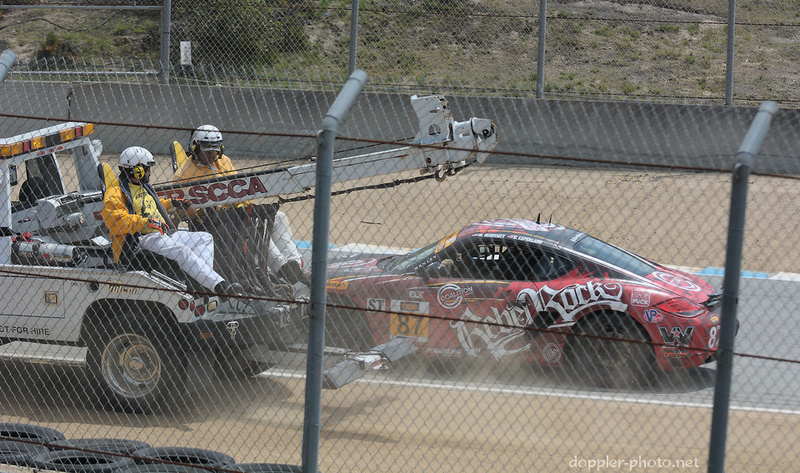 Finally, the safety crews help to actually take action on-track when things go wrong. In this case, the #87 Rebel Rock Cayman stopped on-course, likely due to an engine or transmission issue, and got a tow up the hill. So for now, to all of the people who serve in our armed forces, and to the folks who help support aspects of our lives that are closer to home: thank you.